Haus Blong Miranda (Miranda’s-House) is more a village-with-villagers, than a house. It’s many places in one: coming-together places, being-apart places. To the street and sea, it’s a village-of-pavilions: friendly, traditional. Cars stop quickly, enabling a meandering way through – for people, landscape, view, breeze. Platforms step sea-ward: they nestle, they perch, accompanied by hardworking, tropical natangorah-thatched-rooves which create deep-shelter, shade and dark-cool internally – and waving, joyous fringes. Primary pavilions are an essay in exquisite local kwila-hardwood, anchored to site-cuts through local-coral-stone and polished-coral-concrete. Almost wall-less, they are broadly opening, then shuttering; never of glass, but with slats, fine-timber-louvres and split-woven-bamboo. Freer-form nakamals afford making/party/play-spaces and shelter-points around the site. 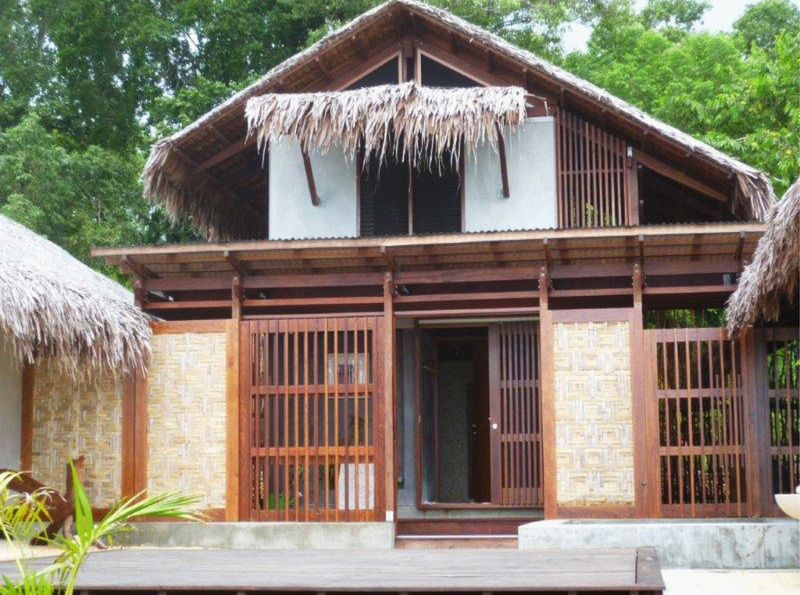 Here, bush-timber-and-natangorah structures follow the whim of Ni-Van builders. Spaces-between are transitions, journeys-with-outdoor-art, places to hold-and-show collectibles and gifts. Open House: the site becomes the house, the house the site. This project’s about comprehending traditional-construction, reshaping for contemporary knowledge: tradition and niu-way, side-by-side. It’s about design for cyclones: learning old principles, applying new translations. It’s about working with Ni-Van trades&craftspeople, but through commercial engagement: old economy, new economy. Kastom land is leased, but kastom owners are on-site, too: 2-way learning continues. Open-house: a dot in Miranda’s Vanuatu-journey: Haus blong Vanuatu.